Labec Superior Performance Dehydrating Oven is suitable for applications of fast removal of moisture within the oven, where high levels of moisture are present specifically soil laboratory or soil testing. Using a unique heating system with elements behind the walls provides excellent temperature uniformity. 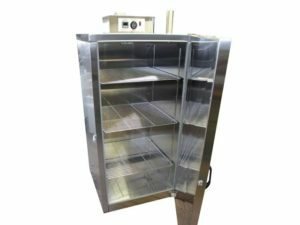 The chamber is fully sealed to prevent leakage into the insulation layer and is fitted with top mounted extraction vents which provide continuous positive ventilation. Uses fan forced convection heating to circulate the warm air inside the chamber providing improved uniformity & recovery after door opened. Features 304 grade stainless steel interior.